What is in a name? Names can be very powerful, reflecting one’s character and identity. Names are associated with family but there is so much more to families than we normally acknowledge. 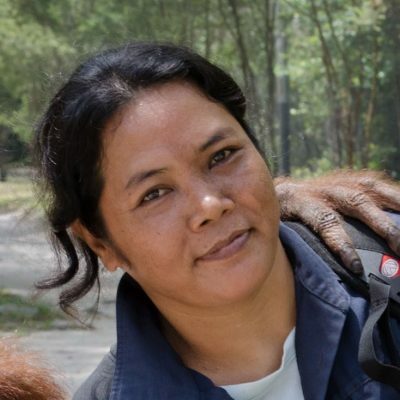 Orangutan families know each other not by names but by other senses such as touch, sound, and smell, all often far beyond our mere human perspective. Orangutans may lead a semi-solitary life in the wild, but no child can forget the mother who brought him/her into this world. There is also the “family they choose” in their juvenile years as the orangutan youngsters at Orangutan Care Center and Quarantine (OCCQ) forge friendships with their peers. 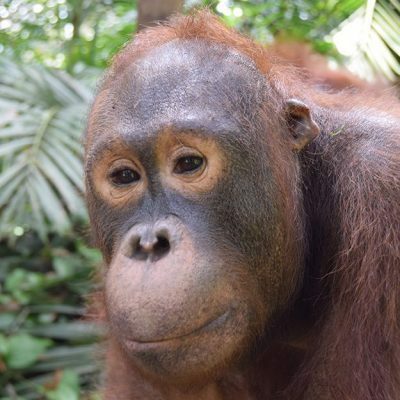 Most of the orangutans brought to the OCCQ have been given names by their previous “owners.” Other arrivals may receive the name based on where they were found and some even from the time of year they arrived. There are those who have the suffix “baru” (new) or that have numbers attached after their name, such as is the case with Jambul2. Already arriving with the moniker Jambul, the 2 was added to distinguish him from the already incumbent Jambul. Jambul was released back to the wild in 2017 so Jambul2 carries on the name. In Indonesian, “Jambul” means tuft of hair. Applying this to Jambul2, with his hair parted either side as if he’s in the early stages of auditioning for a boy band, the name relates to his appearance. Combined with his oval shaped head and distinctive looks, this all sets his appearance apart from other orangutans. 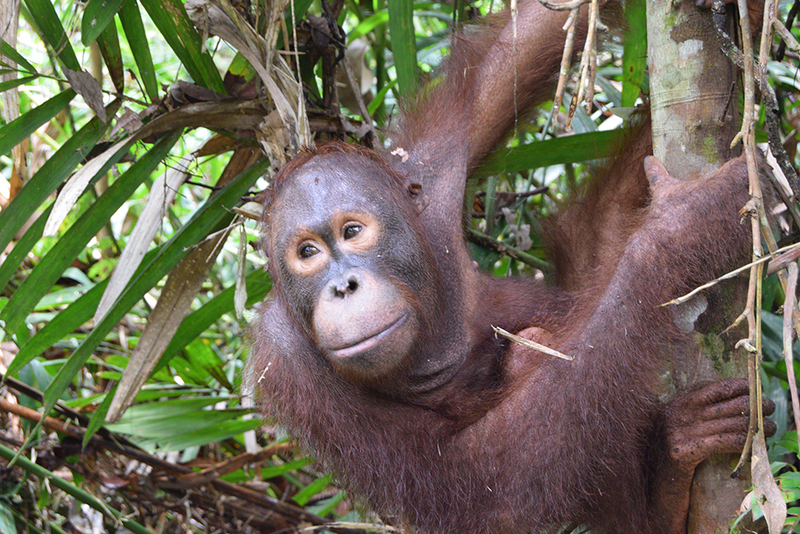 Jambul2, then a 6-month old orphan, was found and confiscated by OFI a number of years ago. But his innocence and loss can still be seen written across his face. We can imagine those days in captivity before OFI rescued him when he was confined to a small cage wondering where his mother was. Why wasn’t she there? Why had the world suddenly become so dark and small? To ensure Jambul2 didn’t have to suffer from these thoughts again, ample space had to be provided. “Pondoks” (shelters) overflow with orangutans so additional ones are constantly constructed to keep up with the stream of new arrivals. Pondok Medang, a relatively new addition to the OCCQ, is an ideal one for Jambul2 as it is located right at the forest edge. Jambul2 can basically roll out of “bed” and he is right there in the forest! This he frequently does. Always ready to play in the learning forest, he and his equally energetic “roommates” fall over themselves to be the first ones out when it is time for their daily release. Once he is out of his enclosure, Jambul2 is eager to maximize his time. Tugging at the arm of one of his caregivers, he indicates for them to hurry up, like a toddler afraid to miss the start of his favorite T.V. program. His youthful exuberance seems to overtake all other faculties. 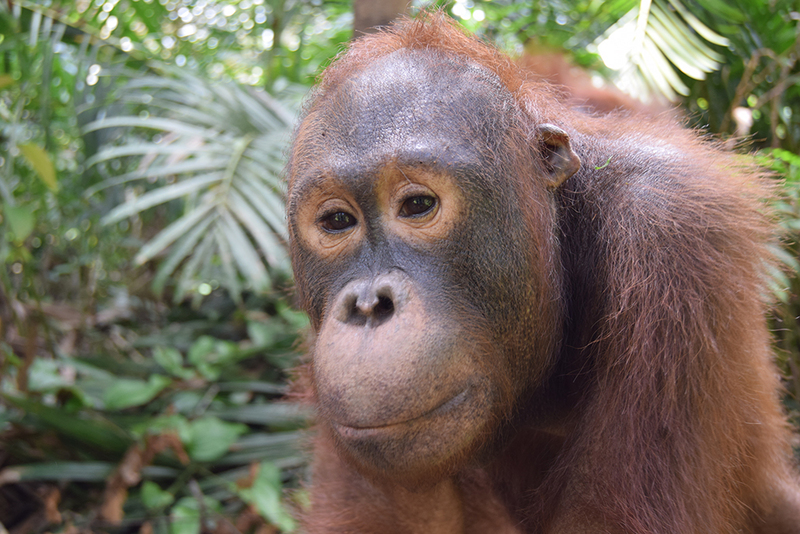 Jambul2 is a very calm and good natured orangutan. He is never “nakal” (naughty in Indonesian), his caregivers proclaim as they stand on the boardwalk watching him perambulate to either side as he leaves no area in his path undisturbed. Jambul2 casts his thoughtful gaze around himself, contemplating “what next”. Behind his deep brown eyes, the cogs are always turning. A wry smile creeps across his face, conspiratorially looking from left to right, as he makes his decision. Jambul2 shoots up a tree and hangs from the branches that crisscross the forest. He moves ever onwards as the gossamer leaves falter in submission. Roly-polying his way through the forest, Jambul2 resonates a self-assured attitude one can only envy. People spend years meditating, searching for answers, sitting at the bottom of a tree yearning for enlightenment. Jambul2 seems to have already found it. 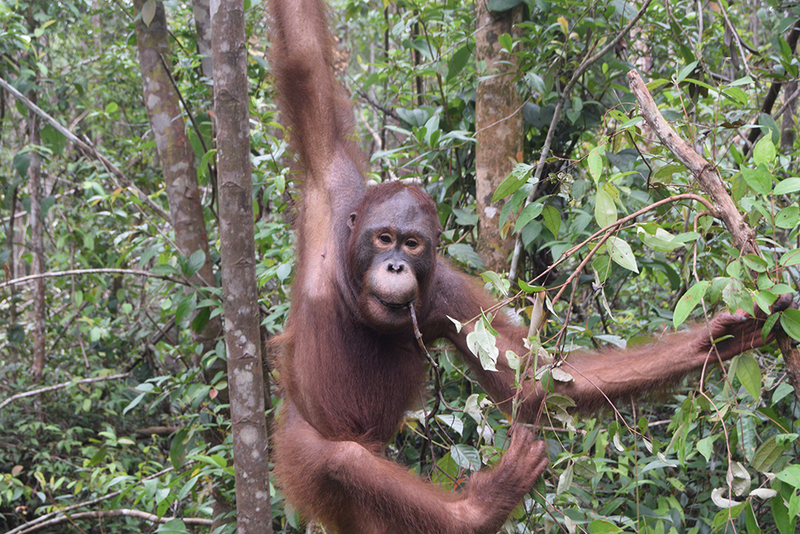 The forest is the orangutan’s domain and he knows it. He sits serenely at the base of a tree, usually chewing on something he has stuck into his mouth. This can range from old branches, leaves, or any other item of interest he comes across during his peregrinations. Jambul2 is a very tactile orangutan, always enjoying physical contact with the natural world around him. Jambul2 may not be naughty but he does enjoy testing his own and his caregivers’ limits. While he has an insatiable desire to enter the forest it is a different story on the way home. Suddenly Jambul2 seems to lose the use of his legs demanding to be carried all the way back to his sleeping enclosure. This is his way of saying, “If you want me to go back you’re going to have to do the work.” Luckily he isn’t too heavy just yet. He still has some growing to do. On the way back from the learning forest Jambul2 clings close to his caregivers, but his wandering hands may try to open a nearby backpack to see if there is anything worth taking. He accepts defeat gracefully when his caregiver discourages this. Jambul2 knows the rules. Jambu2 is still only a juvenile with the white skin circling his eyes symbolizing his youth. These eye patches will darken as he grows older and wiser. Like a delicious iced fruit bar (a favorite snack! ), Jambul2 has a sweet outer coating, instantly winning over onlookers, but a complicated complex centre completes his character. To an orangutan, the family name may not mean so much but the fact that Jambu2’s lineage may be carried on is a cause for celebration. In addition, the orangutans at OFI’s Care Center may not have chosen to be there but they have become part of a large extended family bonded by more than blood. 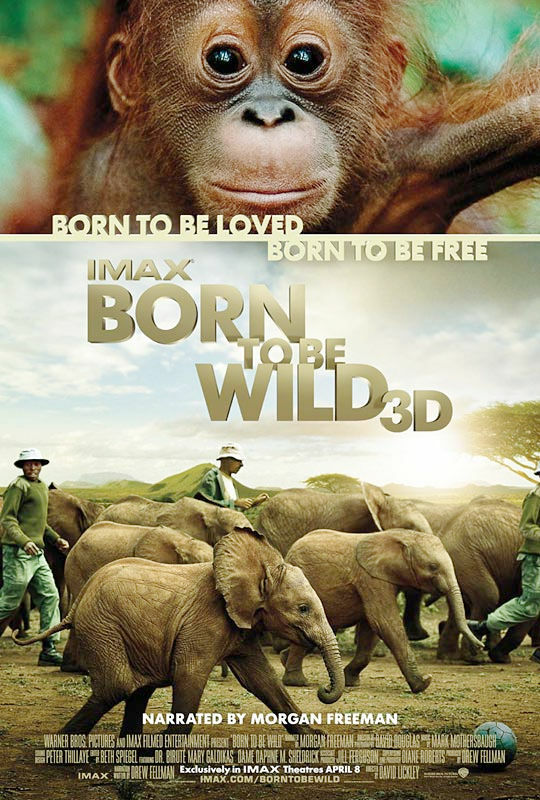 Jambul2, in his own way, honours his mother, his family, and all orangutans by simply embracing life each day. I had the honor to take care of him and other 9 baies in 2012 for a month. i remember that sweet look in his eyes, impossible to forget. Iam soooo happy to see him again and know he is doing great!!!! 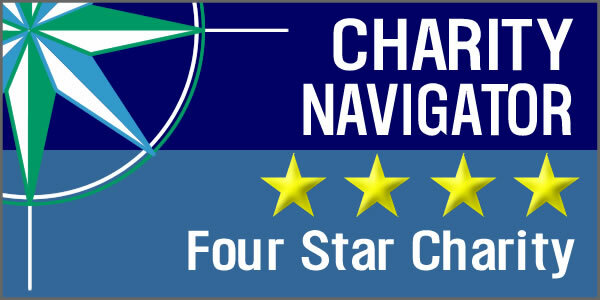 Congratulations to all the people that work there.